Welcome to my Patreon Update for April 2017. 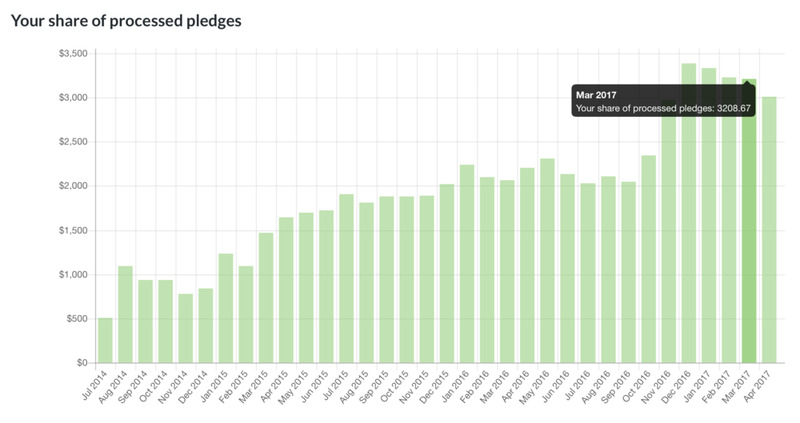 This is the monthly report for my Patreon campaign and how it's performing, as well as my chance to thank everyone for their ongoing support. Let's get started with last month's earnings. Below you can see my transparency report regarding all the pledges that were received and processed for March. Going into March, much like advertising revenue, month-to-month earnings are slightly down. However, this can be viewed as perfectly normal, so I don't think it's a call for concern just yet. Month-to-month earnings may be on a slight decline at the moment, but I don't see this turning into a serious concern at any point in the near future. Post-holidays numbers are typically low within the first few months. And besides, if you compare numbers to this time last year, you'll see that my Patreon campaign continues to perform quite well. It's generating $1,000+ in overall increased pledges. In an effort to keep my campaign feeling new, I refreshed its website recently with a few interesting tweaks. The first noticeable difference is an all-new homepage, which I think does a nice job at explaining what my Patreon campaign is all about and how it can benefit new patrons — including a sneak peek at rewards that can be claimed when pledging. Another thing that you may have noticed immediately is the addition of testimonials from actual patrons. A few of these testimonials can be seen on the new homepage, but the entire collection resides on its own Testimonials page. I would like to extend a huge thank-you to those who took the time to make this possible. If you're interested in submitting your own testimonial, you can do so here. Your support is appreciated! And finally, the website in general is cleaner and easier to navigate. This especially applies to the Patrons Showcase, which is quickly filling up with $10+ patrons. As additional patrons join the showcase, I will be sure to accommodate space and be sure they receive their promised exposure. Every click counts, right? For this month's $25 Amazon gift card giveaway, I would like to congratulate Rup Sarkar for winning April's drawing! You'll be hearing from me shortly. And just like that, another Patreon Update comes to a close. If anyone has ideas on how I can continue to improve my Patreon campaign, please do not hesitate to comment below or email me. Every bit of feedback helps!